To accommodate a growing congregation, the original log cabin meeting house was replaced with a clapboard frame building near the same site as the log cabin in 1749. 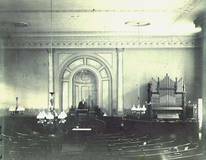 The building was 55 feet long and 35 feet wide, with the length running east and west and the pulpit on the North. There were 52 pews on the floor and 26 pews in the gallery. 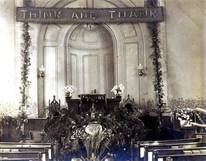 When this became too crowded, the building was sold and removed, and in 1839 a new church in classic Greek revival architecture, was constructed of brick. This structure was enlarged in 1869 and altered in 1908. 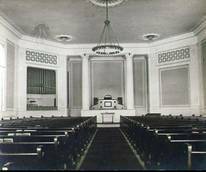 In 1960 the pulpit and choir areas were changed to the present arrangement. The sanctuary, church yard and oak tree are listed in the National Register of Historic Places. The Education Building and Memorial Chapel, adjacent to the church, were erected in 1955. Across the street is the Church House, built in 1967, containing a library, parlor, youth center, classrooms and offices. This space and the Educational wing are in frequent use during the week by the congregation and community. The Church Yard has been a community “burying ground” since the early 18th century with the oldest stone dating to 1736. Dominating the yard is a white oak, estimated by tree experts to be over 600 years old. Its dimensions are 156 feet in the spread of its limbs and 20 feet in the circumference of the trunk. Under this tree George Whitefield, the celebrated evangelist, preached in 1740 to some 3000 people. George Washington and his troops are said to have “rested under the old oak in the cemetery” on several occasions.